The Neutrogena Microdermabrasion System is a starter kit for those who want smoother, softer, and more radiant skin. This kit comes with a microdermabrasion applicator, one-month supply of rejuvenating puffs, attachment head, and 2 AA batteries. This particular kit is definitely worth looking into if you are serious about taking care of your skin but don’t want to spend a ton of money to start off. Getting professional microdermabrasion treatments can be quite expensive, but there are lots of effective tools and equipment for home use, including this one. 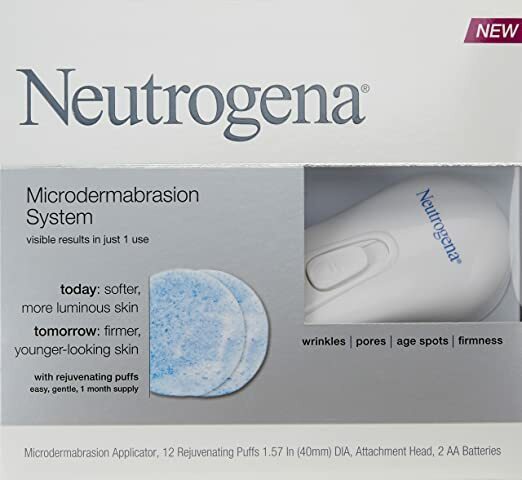 While the Neutrogena Microdermabrasion system may be more of a treatment than a daily cleansing system, it does have quite a bit to offer when it comes to sheer effectiveness and ease of use. Using this device is incredibly easy, so you shouldn’t experience very many problems with it. This microdermabrasion at home machine vibrates because of the fact that the puffs contain crystals, which some people have said are too harsh on their skin when used with a circulating machine. 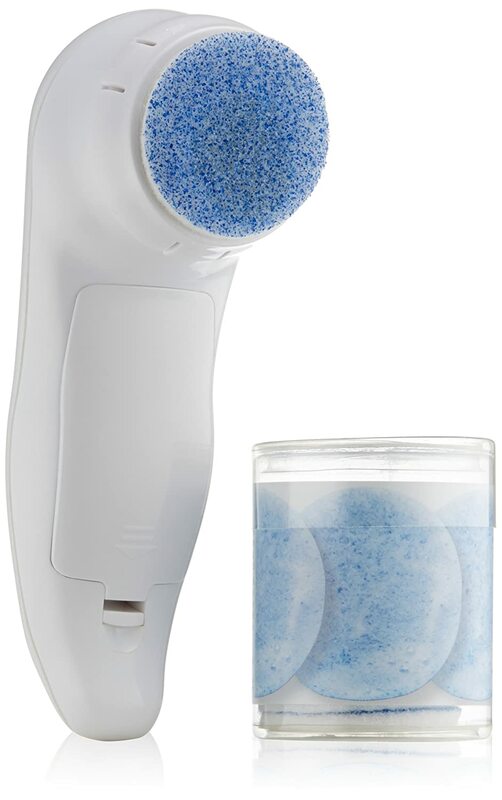 One of the best things about this device is that the puffs use the same microdermabrasion crystals as the ones that are used by professionals. Priced at just under $17 (July 2015), this product is a great deal for those who want to start getting into home microdermabrasion. Most people who have purchased and used this product say that it is very effective at removing dead skin for a healthier-looking complexion and softer skin. The various people who have reviewed this product usually state that they have noticed a huge difference when it comes to how their skin looks and feels after using it. Using this product is easy and convenient. The instructions that come with it recommend using the device three times a week in place of a normal cleansing scrub. Some people have complained that this product is cheaply made, but for the price that is to be expected. There are others who claim that the dermabrasion cleanser didn’t produce any results with their skin, but there are a number of factors that can determine the results a person who uses it will get. The fact is that while this product can offer those with a dull complexion or certain skin imperfections a way to improve their skin, it is not a complete substitute for professional microdermabrasion treatments. It is important to manage your expectations when buying the Neutrogena Microdermabrasion System, because the fact is that it is not a replacement for professional skin cleansing/exfoliation treatments. If you want to have your skin exfoliated, go to a professional. If you are interested in doing it at home and want something to start off with, this is definitely a good investment to make. Microdermabrasion can make a huge difference for those who have superficial scars, wrinkles, fine lines, and other imperfections of the skin, and this system can definitely help with those problems, but only to a degree.